"The Assignment" is a national juried book arts exhibition co-sponsored by the College Book Art Association and the 23 Sandy Gallery in Portland, Oregon. The selected books are on exhibit at the gallery through January 9, 2010. Congratulations to the Philadelphia artists included: Katie Harper, Tricia Treacy, and Donna Globus. Click here to see the online catalog of "The Assignment." This exhibit of artist books, gathered in honor of Ruth Hughes will be on display until December 30, 2009 in the Art and Print and Picture Department Galleries on the 2nd floor of the Free Library of Philadelphia, 1901 Vine St.
After the exhibition, the collection will be donated to Oberlin College's Clarence Ward Art Library. Initiated by Alice Austin, the Ruth Hughes Collection of Artists’ Books was created entirely through donations, primarily from the artist-creators themselves. The resulting collection reflects the great diversity of materials, themes, and formats employed by book artists from all over the Unites States and Britain. To view video and pictures from the opening reception click here. Books, prints and unique gifts will be on display and for sale by undergraduate and graduate Book Arts students this week at The University of the Arts. December 17, 4 – 7 p.m. Yesterday many people gathered at the Free Library of Philadelphia to participate in and peruse Philadelphia Center for the Book's most successful annual event. 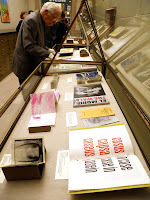 If you could not make it out this year to the artists' book fair, here are some pictures to recap.